FacesMessage is used to show confirmation, warning, information. In this tutorial, you will see that how to use Faces Message to show any information, warning or any error. 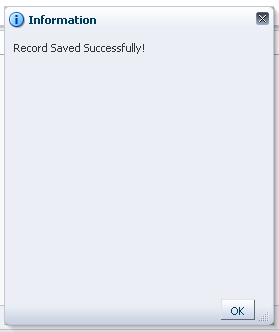 Suppose you want to show a confirmation when you save your records, here we use Faces Message. How to show similar functionality in 12c. I’m using JDev 12.2.1.3.0 version and suggested code is not working and throws NPE. Please suggest how to implement in latest version instead of 11g. It should work, Is there any error or exception? No, there is no error or exception in the log file. I have submit button in the login page and the user clicks without username/password then suggested code working fine in 11g bu displaying error alert message whereas in 12g latest version, getting NPE. Can you check on which line you are getting NPE? No, its getting NPE after return statement where I don’t have any control. How to handle in the jspx page?